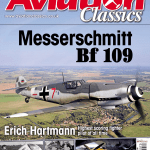 Welcome to the second edition of Aviation Classics supported by the aviation industry. Joining Saab, we would like to thank RUAG Aviation, the Swiss aerospace group that maintains, upgrades and supports the Swiss Air Force Northrop F-5s that were built under licence in the country. Thanks to them, once again I find myself at the end of producing an issue having learned a vast amount about a subject I thought I knew well. As anyone who reads this page knows, that is one of the joys of this job. So it was with Jack Northrop and the companies he founded, the last of which went on to build the lithe, shark like fighter this issue is dedicated to. Before I told the story of the company, I wanted to tell the story of the man. Not just because his flying wings captured my imagination as a boy, but because his lifelong work to advance aerodynamics in his very individual way is why I believe the fighter existed in the first place. Let me explain. All his life Jack Northrop wanted to go his own way, develop his ideas. This ambition manifested itself in the list of companies he founded and the aircraft he designed while working at them. It was also evinced by the fact that once he was forced from the drawing board, once he was unable to do what he felt was his calling in life, he left, usually to begin again from scratch. That he always found backers and supporters for his new ventures speaks volumes for the obvious value of his ideas and designs. His innovations always made money. Ask the Lockheed brothers, ask Donald Douglas, every aircraft that Jack designed for them sold in hitherto unheard of volumes. But every time, once the desire set in to keep making money and stop taking chances at the cutting edge of aeronautical development, Jack Northrop left. Now, is that arrogance? A Nordic stubbornness perhaps? Or instead is it a vision so clear, so breathtakingly simple, that the man had to pursue it no matter what the cost. Jack Northrop spent his whole life going against the grain, swimming upstream, in order to build the most efficient and effective aircraft he could. He never took the easy, accepted route to solve problems he encountered, always trying the unexpected or innovative to get to where he wanted to be. To me that is courage, pure and simple. Many people see the Northrop Grumman B-2 Spirit as a vindication of Jack’s greatest dream, the pure, birdlike efficiency of the true flying wing. I see it as the second step, the first was taken by the man himself in the XB-35 and Y-B-49. Look at the designs other companies have been proposing for years, blended wings, flying wings, cargo transports and airliners that have little in the way of a fuselage. One day one of them will have the courage to build one, to take that next step in the evolution of the truly efficient aircraft. Many already have in the stealthy UAVs and UCAVs currently on the market. 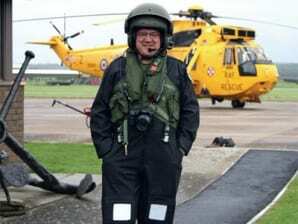 Not a lot of fuselage there either you might note. So what has this to do with the F-5 I hear you ask? Well at the time Tom Jones, Welko Gasich and Lee Begin were working on the idea proposed by Edgar Schmued, every other fighter on the drawing board was bigger, more powerful and better armed with more complex systems. The F-5 was exactly the opposite, small, inexpensive and simple. It was a real risk, by people who had mostly learned their trade working with a man for whom taking risks was the way forward. This particular risk went on to become one of the best selling and longest lived jet fighters in aviation history. Through upgrades, today it boasts capabilities that are the equal of its larger brethren. I like to think the spirit of Jack Northrop lived on in his company after his retirement, and like him, the F-5, the little shark of a fighter, successfully swam upstream. While the USAF’s major interest in the N-156 programme was the two seat trainer version, work continued on the N-156F, the single seat fighter intended for the international market. This was to emerge as the F-5, and go on to be used by 37 countries worldwide, a second major success for Northrop which built 847 of the first three models of its lightweight design. While the T-38 was in development, Welko Gasich and Lee Begin continued the design of the single seat version of the aircraft under the company designation N-156F. As more data became available from the trainer programme, this was incorporated into the fighter, resulting in a great deal of commonality between the two variants. As before, cost effectiveness and ease of maintenance were key factors in the design, as was structural strength, to allow overseas customers with tight budgets to maximise the number of aircraft they could buy as well as their length of service. Like the T-38, the entire rear fuselage detached at a sharply angled joint to enable easy access to the engines and their systems. A track and trolley was fitted into the top of each engine bay, to allow engineers to remove the engines for maintenance with the minimum of external equipment. The engines themselves were mounted in the airframe complete with their attendant hydraulic pump, generators and gearboxes to form a single unit, again easing maintenance. The wing was fitted with the same leading edge slats and full span flaps of the trainer, but featured a leading edge root extension or LERX which increased the lift available and improved manoeuvrability in the fighter. This feature is the major identification difference between the types since the T-38 never had them. Two underwing pylons could be fitted, along with one on the fuselage centreline for the carriage of weapons or drop tanks, and ‘waisted’ wing tip fuel tanks could also be carried. Armament for the fighter was based around two 20mm M-39 cannons, mounted First World War style in the upper fuselage ahead of the cockpit. 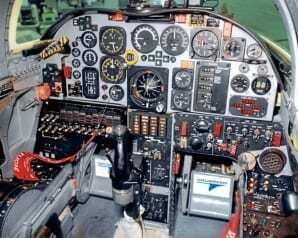 One F-5 pilot once commented to me that it was this feature alone, firing those guns ahead of the cockpit that made him really “feel like a fighter pilot”. A pair of AIM-9 Sidewinder heat seeking missiles could be carried, one on each wingtip on a detachable rail that could be removed to fit wing tip tanks or to reduce drag. The centreline pylon could carry 2000lb (907kg) of ordnance, each of the wing pylons 1000lb (454kg) each. A wide range of bombs, rockets and missiles could be carried to allow the aircraft to operate in the interceptor or ground attack roles with no changes to the onboard equipment. There were three other features built in from the start of this design which were unusual for aircraft of the day. An arrestor hook was mounted under the rear fuselage to allow engagement with Runway Hydraulic Arrestor Gear (RHAG), to stop the aircraft in icy conditions or in the case of a brake failure. The fighter also had a 15ft (4.6m) brake chute at the rear base of the fin to shorten the landing roll where needed. The fuel system was designed from the outset to incorporate an air-to-air refuelling probe when required, the probe being available in a kit that could be mounted or dismounted as the operational needs of the customer dictated. Lastly, the fuselage structure had built in hard points to mount jet assisted take off equipment, as it was envisaged that some customers may wish to operate the aircraft from short or unprepared dispersed airstrips in time of war, the already strong undercarriage was built from the outset to withstand this kind of use. What the design team created was an incredibly flexible, adaptable, strong, easy to maintain and yet still high performance fighter that would be cheap to operate in numbers, a remarkable achievement by any standards. Before continuing with the development story that led to the world famous fighter, it is worth noting that an additional study was going on at the same time as this design work. A version of the design was laid out with a larger wing and more internal fuel, along with a fully capable arrestor gear and still further strengthened undercarriage. These were the last attempts Northrop made to introduce a navalised version of the fighter, which was offered to the US and Australian navies in two different formats. At the beginning of 1958 the USAF and the Department of Defence (DoD) were shown the modified engineering mockup of the N-156F in its final form. This resulted in an order for three prototypes and a static test airframe on February 25 1958, the funding coming from the FX programme, a USAF project that supported the Military Assistance Programme (MAP), a US Government initiative begun in 1949 aimed at providing military equipment to friendly nations to contain the perceived threat of Soviet expansionism. The choices of MAP equipment were regulated by the DoD’s International Security Affairs Agency (ISAA), who supported the aircraft as the ideal choice for supplying to friendly nations. Northrop quickly began construction of the prototypes, a task aided by the existing factory tooling that was already producing the first T-38s. While this was going on, Northrop also began discussions with a number of countries regarding the licence production of the fighter, including Australia, Belgium, the Netherlands, Italy and the UK. Ultimately, these discussions came to naught, but the fighter was to be built in Canada, the Republic of Korea, Spain, Switzerland and Taiwan. The first prototype, 59-4987, had to be fitted with the same J85-1 engines as the first T-38s because the afterburning versions were not ready. Despite this, on July 30, 1959, only four months after the first T-38 flew, Northrop’s chief engineering test pilot Lew Nelson made the first flight. The performance of the single seater, even with the low powered engines, was astounding, easily breaking Mach 1 on this first 50 minute flight and, according to Nelson; “performing like a well educated lady” throughout the test. The second aircraft, 59-4988, joined the test programme and was used for field maintenance and rough strip performance trials. These were carried out at Pensacola, Florida, in June 1961 and included landing in 1300ft (396m) on grass and taking off with a maximum fuel load from the same surface in less than 2500ft (762m). At this point, the USAF was supporting a simplified version of the F-104 Starfighter for the MAP programme and not the N-156F, which caused Northrop to slow the programme down as the company had been funding the development entirely on its own prior to the order for the three prototypes. However, the US Army’s interest had been aroused by the rough field trials, as it was looking for a new close support fixed wing aircraft. Comparative trials between the second N-156F prototype, the Fiat G.91 and the Douglas A-4D-2N Skyhawk were held at Edwards Air Force Base for two months from January 1962. The army report clearly favoured the N-156F for its ruggedness, in-the-field maintainability and reliability. It was also noted that the small size of the aircraft and its small air intakes made it less likely to suffer damage from ground fire during ground attack missions. However, the USAF would not agree to the army operating its own fixed wing aircraft, a position supported by the DoD, so the army was to develop helicopters as its own support aircraft and the project was dropped. At this point, it seemed to many at Northrop that the single seat version of the aircraft was dead, when the Kennedy administration decided a new, low cost export fighter was required for the MAP. The ISAA of the DoD informed Northrop that the N-156F was the victor of the resurrected FX programme on April 25, 1962, then on August 9 gave it the official designation F-5 and the official name of Freedom Fighter. The only changes required to the prototypes to fully conform with the FX specification was to fit the cannon armament and increase the external weapons load by fitting four wing pylons instead of two, which required local strengthening of the wing. Lastly, an additional fuel tank was fitted in the nose bay. The third prototype, 59-4989, became the YF-5A and flew for the first time on July 31, 1963. This really kick started the F-5 programme, with 71 aircraft being ordered on October 22, followed by a second order for 99 more as the MAP funding to the USAF was increased to $83 million. Such was the sudden urgency behind the fighter requirement, the first production Northrop F-5A, 63-8637, made its first flight in October 1963. At the same time as this huge increase in activity, a two seat version of the fighter was initiated, known as the F-5B. It had been decided that a trainer version of the full weight fighter airframe would be a far better platform to introduce trainees to the handling of the fighter than the much lighter T-38. 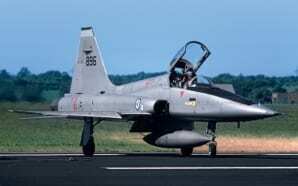 The T-38’s take off weight was 11,700lb (5307kg), compared to the 20,100lb (9117kg) of the F-5A. The F-5B also retained the operational capabilities of the single seat F-5A, albeit without the cannon armament, enabling it to fill a dual role as trainer and strike aircraft. The nose was stretched to accommodate the second seat, deleting the cannons, and the air intakes were slightly modified to feed the new J85-GE-15 engines which now produced 4080lb (1850kg) thrust with afterburner. Given the company’s experience with the T-38 programme, now in full production, the first F-5B, 63-8438, made its first flight on February 24, 1964. Interestingly, after thorough flight testing, the F-5B was accepted and declared operational by the USAF on April 30, some four months before the single seat F-5A. The 4441st Combat Crew Training Squadron of the Tactical Air Command, based at Williams Air Force Base near Phoenix, Arizona, was the first USAF unit to be equipped with the F-5B on that date, and was to be responsible for training the aircrew of MAP supplied countries on the F-5. In February, Norway, followed later by Iran and Korea, had announced its selection of the F-5 as its new fighter. The first contingent of pilots, made up of Iranian and Korean pilots beginning training with the 4441st in April as the F-5B was declared operational. The eighth F-5B of the production line, 63-8445, became Northrop’s company demonstrator, making a tour of European and Middle Eastern countries between June and September 1964. The success of this tour, combined with the excellent handling of the aircraft and its systems, meant that the first customer for the F-5A and F-5B was the Imperial Iranian Air Force. The IIAF received its first 11 F-5As and two F-5Bs on February 1, 1965, at Mehrabad Air Base and would eventually acquire 107 of the first generation models of the F-5. The performance of the aircraft, along with its low initial and operating costs quickly attracted customers from all over the world, as will be related later in this issue. Altogether, Northrop built 624 F-5As, including the three prototypes, and 134 F-5B two seat operational trainers before production switched to the F-5E and F in 1972. 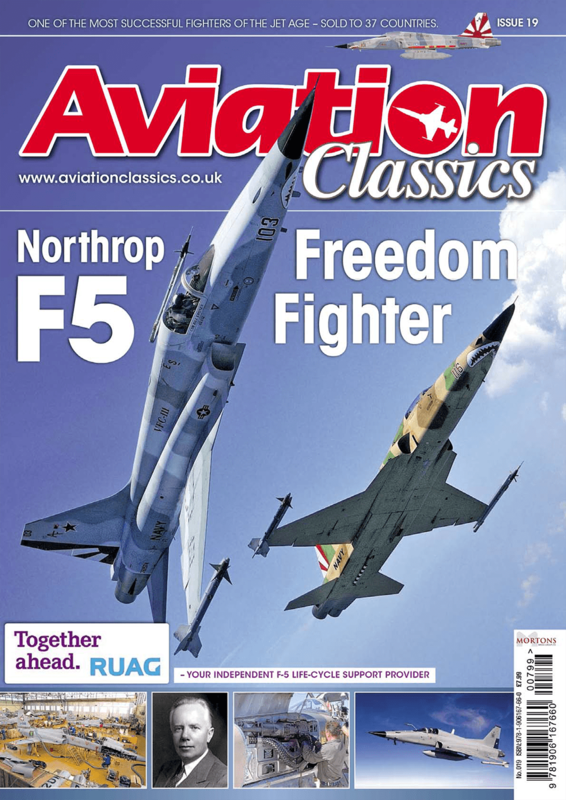 There were also 89 of a third variant of the early airframe built, the RF-5A reconnaissance platform, but these will be covered later in this issue. This large scale success came about from the application of sound, simple engineering practices in the airframe from the first design drawings. By keeping all of the costs as low as possible, and by making it possible to maintain the aircraft with basic tools and little equipment, Northrop created a fighter that countries could not only afford to buy, but afford to operate. The strength built into the airframe from the beginning meant that it would also remain serviceable for a long time under service conditions. It is no surprise to learn that several countries still operate the first generation of F-5s, often modified with new avionics and having undergone some degree of airframe refurbishment it is true, but the fact remains that the 49-year-old fighter is still perfectly capable of operating in a modern combat environment, an incredible achievement and a real credit to the men and women who designed and built them. The simple and lightweight F-5 airframe also proved to be extremely adaptable to a variety of uses, some of which required extensive modifications to the airframe. The success of the fighter with international air forces also led to the development of an advanced version intended as a replacement. As well as the developments by Northrop, two additional unlicensed life-extension and redesign programmes have been carried out by HESA in Iran to produce a viable fighter bomber for the Islamic Republic of Iran Air Force (IRIAF). The increasing capabilities of Soviet Bloc aircraft throughout the 1970s meant that several F-5E customers, especially Taiwan, pressed the US to provide greater capabilities for the fighter, such as an improved radar and the carriage of the semi-active radar guided AIM-7 Sparrow missile. The US Department of Defence requested that Northrop study the feasibility with which a suitable radar could be fitted to the F-5E, resulting in a design known as the F-5G. Changes in the US Government’s weapons export policy in 1977 meant that this study was never taken any further, but by the end of the decade, this policy had caused a number of US Allies to seek advanced fighter aircraft elsewhere, such as the aerospace industries of France and Britain. On January 4 1980, a new competition for an export fighter, known as the Intermediate Export Fighter or FX, was begun by the State Department in order to recapture this market and appease America’s allies. Northrop reissued the F-5G proposal, General Dynamics responded with a lower powered, simpler version of the F-16, known as the F-16/79. With the inauguration of Ronald Reagan as US President in 1981, politics were again to interfere in the development of the F-5. Initially, the FX project was approved, then shelved, as the export of front line equipment was now allowed, then resurrected in 1982 as a fully-fledged programme. However, by 1980 Northrop realised that the new F-5 model would have to at least be on a par with the F-16 in terms of performance and capability, as the little fighter was now in direct competition with it. To meet these performance requirements the F-5G proposal was much modified, resulting in the new designation of F-20 and the name Tigershark being applied to the project in 1983. The redesign began with basing the aircraft on a single and much more powerful engine, a concept that had been under design study since the beginning of the F-5 programme. In order to surpass the F-16’s performance, the General Electric F404 was selected, as Northrop already had some experience with the original YJ101 version of this turbojet in the YF-17 Cobra prototypes. In fact, the F-5/404 concept had been put forward as early as May 1975 as a possible F-5E upgrade. This choice alone called for wide ranging changes to the fuselage design, which had to be 5in longer with bigger inlet ducts and redesigned ramp doors to accommodate the greater amount of air the engine required at the greater than Mach 2 projected maximum speed. The wing did not change much, except for modifications to the leading edge extensions, which improved the lift performance for a minimum of increase in wing area, and internal strengthening to take the stress of 9G loading. A 30% larger tailplane was added to improve the pitch rates the aircraft could achieve and reduce its turning radius, an improvement assisted by the addition of a new fly-by-wire control system. Improved avionics and radar would allow the carriage and delivery of a greater range of weapons than previously. The first aircraft, initially known as the F-5G-1, was essentially a re-engined F-5E with a modified rear fuselage to accommodate the General Electric F404 of 16,000lb (7257kg) thrust. Little else was changed. It was given the serial 82-0062 and the civil registration N4416T and test pilot Russ Scott made the first flight for 40 minutes on August 30, 1982, from Edwards Air Force base in California’s Mojave desert. The performance that the 60% increase in thrust gave the fighter was astounding, enabling it to fly in excess of Mach 2 and reach an altitude of 55,000ft (16,800m). The lower fuel consumption of the F404 also gave an increase in range of 10% over the J85 engined version. The sustained turn rate was also improved to 11.5º per second at Mach 0.8, the supersonic turn rates were also improved by 47%. The test flying proved so successful that an initial order had been placed by Bahrain in November 1982 and evaluation by 10 overseas customers had been completed by April the following year. In June 1983, the original F404 engine was replaced by an F404-100 with an additional 1000lb (454kg) of thrust which offered a further increase in performance, including the ability to reach 40,000ft (12,200m) in only 2.3 minutes from a cold start. On August 26, 1983, the second prototype, 82-0063 (N3986B) made its first flight, featuring a completely redesigned nose to accommodate the full advanced avionics suite and the General Electric G-200 radar. The canopy was also redesigned, featuring a bulged hood to give the pilot greater visibility. Known initially as the F-5G-1, this aircraft was followed by 82-0064 (N44671) with a similar full avionics suite and modified nose which first flew on May 12, 1984. A fourth prototype was built using the intended production tooling, incorporating larger fuel tanks, improved flap and slat actuators, General Electric AN/APG-67 multi mode air-to-air and air-to-ground radar and yet another 1000lb (454kg) of thrust from an upgraded engine. The airframe was redesigned to incorporate composite panels and structure, improving still further the power to weight ratio. The F-20A had arrived, as all the aircraft were redesignated as such in the light of the extensive modifications to the original design. Northrop was in discussion with a number of potential customers when tragedy struck. Test pilot Darrell Cornell was killed on October 10, 1984, when demonstrating the first prototype, 82-0062, in South Korea. Less than five months later in May 1985, Northrop test pilot David Barnes was killed at Goose Bay in Labrador while en route to the Paris Air Show. He was practicing his display as part of a company demonstration and crashed under similar circumstances to Darrell Cornell. In both cases, no failure was found in the aircraft or its systems, but the crashes had an effect on the programme and delays were inevitable. Despite its high performance, the USAF and the overseas customers increasingly favoured the F-16, so interest in the F-20 dwindled. Bahrain replaced its F-20A order with one for 10 F-5Es and two F-5Fs, and in 1986 the USAF announced it would be purchasing the F-16 for both the Air National Guard and the Aggressor squadrons, both roles envisaged for the F-20. Later that year, Northrop realised the hoped-for overseas market had been won over by the widely supported F-16 and the $1.2 billion F-20 was finally cancelled. The F-20 was a jewel of a high performance aircraft, completely privately funded by Northrop. Without doubt, its cancellation was a blow to the company, but it was already busy with the development of the B-2 Spirit stealth bomber. Two F-5A airframes, 63-8372 and 65-10573 were converted by Grumman to become the only X-29As, 82-0003 and 82-0049 respectively. These aircraft were extensively modified with canard foreplanes and 33º forward swept main wings and were intended to act as flying testbeds to investigate the aerodynamics of such a configuration. Since forward swept wings suffer from aerodynamic twisting forces which can be sufficiently strong to destroy them, only the extensive use of modern composite materials allowed the construction of a sufficiently strong wing to fully explore the performance. The wing made the aircraft extremely unstable, and was only flyable by way of a triple redundant computerised flight control system. On December 14, 1984, Grumman’s chief test pilot, Chuck Sewell, took the first X-29A into the air at Edwards Air Force Base, four months after which NASA began an extensive test flying programme using both aircraft. The X-29s proved extremely reliable for such an advanced concept, reaching an unheard of angle of attack of 67º and becoming the first forward swept wing aircraft to fly supersonically, the latter achievement occurring on December 13, 1985. The first aircraft was retired in 1986 after 242 successful flights, the second aircraft continuing to fly until 1991. They are both on display today, the first at the National Museum of the USAF at Wright Patterson Air Force Base in Ohio, the second at the Dryden Flight Research Centre at Edwards Air Force Base in California. Without doubt the strangest looking of the F-5 developments, the Shaped Sonic Boom Demonstrator, or SSBD, was a modified F-5E with a bulged forward fuselage. The aircraft was to demonstrate that sonic booms created by aircraft could be substantially reduced by special shaping techniques and allow unrestricted supersonic flight over land. Northrop Grumman as the firm now was, Northrop having purchased Grumman in 1994, won the Defence Advanced Research Projects Agency (DARPA) competition to produce the test aircraft in July 2001 as part of the Quiet Supersonic Platform programme. Northrop’s F-5 was considered ideal to modify to the required smoother equivalent area distribution as it was known, as it was a simple and reliable platform. A US Navy F-5E was restructured at Northrop Grumman’s St Augustine facility in Florida, using modified components constructed at the company’s El Segundo plant in California. The first part of the flight testing was aimed at establishing the flight envelope of the modified aircraft before the SSBD flights could begin. Making its first flight on July 24, 2003, from St Augustine and Cecil Field in Florida, the envelope was expanded with a T-38 in support to include supersonic flight at Mach 1.1, before the aircraft was flown to Palmdale in California. With the support of a NASA F-18 from the Dryden Flight Research Centre, the flight envelope tests were completed and the SSBD flights began at Edwards Air Force Base throughout August 2003, several occurring on August 27. These were conducted over an area strewn with ground sensors under the aircraft’s flight path and to either side to record sonic boom and pressure wave generated by the aircraft. On three flights a standard F-5E from VFC-13 at NAS Fallon in Nevada flew 45 seconds apart from the SSBD to provide a comparison shock wave. Both aircraft were flying at 32,000ft and Mach 1.4 in the USAF High Altitude Supersonic Corridor. Two more flights were conducted with a NASA F-15B fitted with a pressure measurement probe to assess the shockwave near the SSBD. These flights showed the SSBD did indeed have a reduced sonic boom, and a second series, known as the Shaped Sonic Boom Experiment or SSBE, was then conducted in January 2004, again over Edwards, by NASA. Altogether 21 flights recording the sonic boom pressures in varying flight conditions and turbulence were conducted, eight with the standard F-5E and four with the F-15B. In addition, a Blanik L-23 glider from the USAF Test Pilots School was fitted with several sensors and was flown 10,000ft below the SSBD on 13 of the flights. More than 1300 sensor recordings were made and 45 probe data sets were compiled, the aim being to allow future aircraft designers to control the sonic boom produced by their aircraft. The F-5 SSBD is now on display at the Valiant Air Command Warbird Museum at Titusville in Florida, and will eventually be placed in the National Museum of Naval Aviation at Pensacola. The Republic of China Air Force (ROCAF) had purchased the F-5A and B as early as 1964 and by 1975 the Aerospace Industrial Development Corporation of Taiwan was producing the F-5E and F locally in their hundreds. The aircraft were replaced by the Mirage 2000, F-16 and the AIDC F-CK-1 Ching-kuo, also known as the Indigenous Defence Fighter (IDF) during the 1990s, but at least 40 were still in service in training roles into the 2000s, with between 90 and 100 maintained in reserve. AIDC began the Tiger 2000/2001 programme with a view to upgrading these second line aircraft, using the GD-53 radar from the F-CK-1 fighter. The GD-53 was a development of the General Electric AN/APG-67 multi mode radar intended for the F-20, which was itself originally a development to meet Taiwanese defence needs. A single prototype flew for the first time on July 24, 2002, but official disinterest ended the programme. The prototype remains on display at AIDC in Taiwan. With the Iranian Islamic Revolution of 1979, support for the many US aircraft purchased by the deposed Shah was no longer available. Since then, the Iranian Ministry of Defence, the Islamic Republic of Iran Air Force (IRIAF), its Owj Industrial Complex (OIC) and the Iran Aircraft Manufacturing Industrial Complex (HESA) have undertaken modification and upgrades using existing equipment as a basis. These programmes have been the subject of much speculation so here is what little information I have been able to confirm. The first of these, the Azarakhsh (Thunder) was first announced in April 1997 and is believed to be a Northrop F-5E Tiger II with a Russian developed radar which extended the nose by some 6.6in (17cm). This entered series production in June 1999, with between six and nine being built by 2001 against an order for 30. A second prototype flew in February 2001 with strengthened wings, wide use of composites throughout the airframe, uprated J85 engines and the ability to carry locally manufactured weapons. Little is known about the use of these aircraft, but two single seat and a two seat aircraft based on an F-5F took part in the National Army Day flypast at Tehran on April 17, 2008. An enlarged version of the F-5E, also known as the Azarakhsh, was planned, using Russian engines and radar, but was not built as far as can be ascertained. The next version was revealed in 2008, and was a major redesign having its wing mounted in the centre of the fuselage, above the air intakes, to increase its ability to carry underwing loads. The wing was also fitted with a leading edge extension to improve manoeuvrability. The Saeqeh (Lightning or Thunderbolt) first flew on May 30, 2004, having begun development in 1998. Confusion over the prototypes of this aircraft comes from the use of the name Azarakhsh-2 in relation to the first prototype. The Saeqeh has fins, canted outboard, similar to the F-18, and two different versions are known to exist, one with similar intakes to the F-5, others with enlarged square intakes, possibly representing a second version of the type, first seen in August 2006. The intended production version of the aircraft is believed to feature an advanced radar and a full glass cockpit. Three of the fighter bombers took part in the National Army Day flypast at Tehran in both 2007 and 2008, but it is unknown how many have been built. The Simorgh is the last Iranian F-5 development, driven by the lack of two seat training aircraft. HESA is undertaking the conversion of the remaining Northrop F-5A Freedom Fighters in storage into two seat versions, similar to the F-5B.